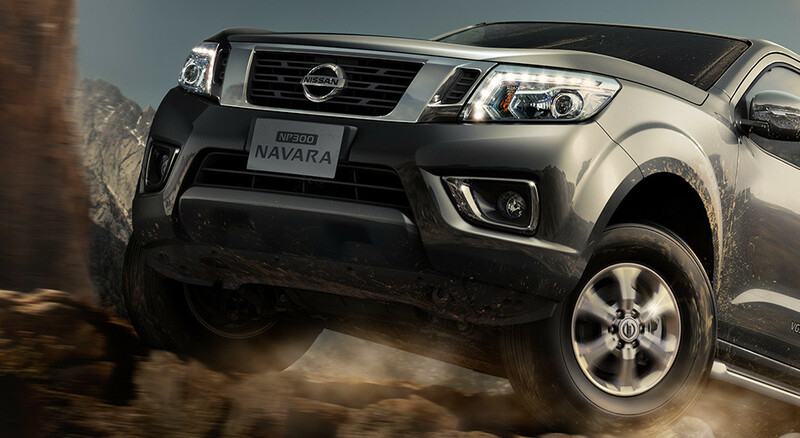 The 2015 Nissan Navara mid-size truck introduced in Thailand last week. With new Nissan trucks — a new Titan in January and a new Frontier coming later as a 2016 or early 2017 model — in the works, could the new Navara, just introduced in Asia, be the doppelganger for the North American Frontier? I suspect so, since it has all the bells and whistles that the market is looking for in a next gen mid-size truck. The Navara (NP300) is the 12th generation of the company’s truck line, and it appears to have the highly competitive fuel economy that has been missing. Back in February, we heard that Nissan North America was testing a new diesel from Cummins, but that is all we have heard to date. So, let’s presume that the Navara is a reflection of the next Frontier. Tow capability and pricing were not announced, of course, but there were a lot of features that would do well here. 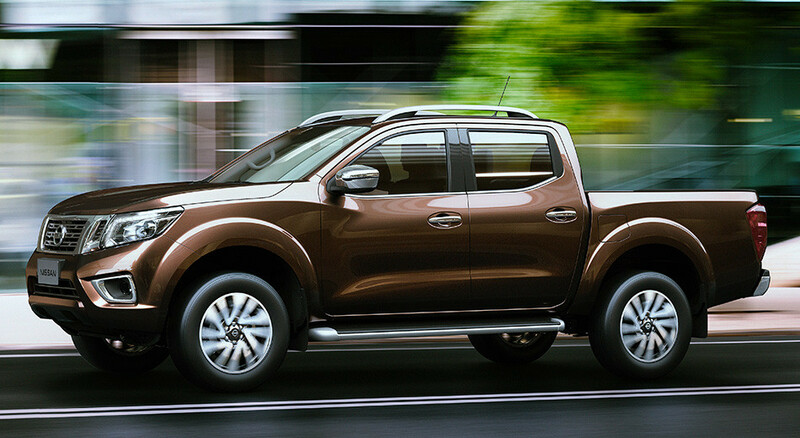 There is improved powertrain performance and a reduction in body mass, a reduction in roof height and higher ground clearance on the Navara, as well as an expanded loading area. Nissan is saying that thre will be narrow through wide body types, king and double cab models, and both all-wheel and two-wheel drive. All of these would make it desirable in Frontier territory. Powertrain performance is improved with reduced fuel consumption and emissions and a dynamic control braking system that Nissan says will make it a leader in the segment. 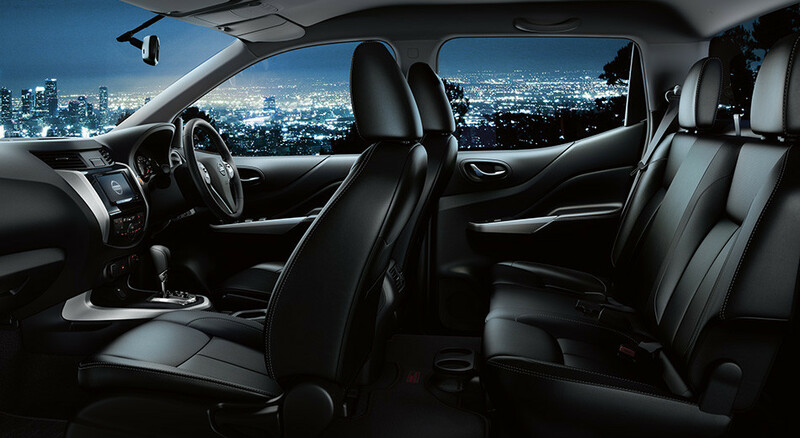 Models come equipped with improved versions of the company’s 2.5L DOHC in-line cylinder diesel engine or a 2.5L in-line gasoline engine. The new diesel features 140kW and 120kW at 3600rpm, maximum torque of 450Nm and 403Nm at 2000rpm and higher boost from a turbocharger with electrical actuator. This has led to 11% better fuel economy. There is shift-on-the fly 4X4 engagement which is so important when off-roading . The Vehicle Dynamic Control sys6tem also improves 4X4 driving performance and safety when combined with Active Brake Limited Slip, Hill Start Assist and Hill Descent Control. Transmission options on the Navara include a seven-speed automatic, which provides low fuel consumptiuon at slow speeds as well as better acceleration, expanded gear ratio for wider speed range and smooth acceleration and shifting; and the six-speed manual also features better fuel efficiency with optimized shift stroke for effortless gear changes. These would all be features that the market would be looking for in the next edition Frontier. While the new Navara looks like a Nissan truck — not a bad thing — the silhouette now features a higher beltline and black B-pillar with a bolder look to the door sections. The look is smooth and dynamic with a lot of Nissan DNA. Boomerang-shaped lighting is striking and distinctive, and chrome waistline moldings and turn indicators mounted in the door mirrors are also attractive. There are new colors — Savannah yellow and earth bronze — which are fresh looking but may not be part of the coming Frontier. The new dashboard features a gentle sweep from center panel to door side. Meters and a tactile steering wheel make use of an aluminum-like finish as an accent, repeated on the center cluster and console. Double stitching, which is appearing throughout the industry, is also featured. 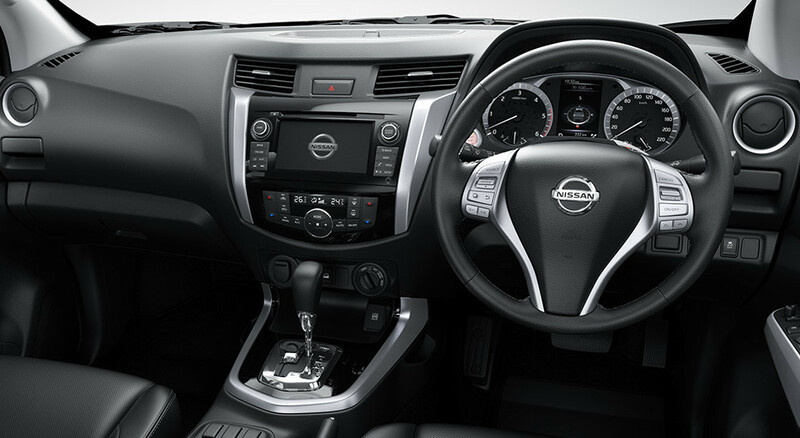 Dashboard and console on the Nissan Navara. Introduced only for markets that use right-hand drive. The instrument cluster is very nice, easy to read and very compatible with a large center console. There are all of the appropriate screens to support infotainment, nav support, etc. As with most newer vehicles, customization is available for most features — a must in today’s market. Whether this is a dead-on reflection of the next gen Frontier or not, it shows how far vehicles have come in this mid-size category. The current segment leader, Toyota Tacoma, is at least a full year from introduction, maybe longer. This could be a capacity issue, since the San Antonio plant that turns out the mid-size leader also produces the new for 2014 Tundra, which is selling well. GM has shown the new Colorado and Canyon mid-size trucks but we haven’t driven them yet. They are very good looking and I suspect a diesel version is in the making. That makes more entrants in this category than there have been in years. What makes them desirable — lots of big truck features, better fuel economy than ever, and — oh yes — they will fit in your garage.